Men “squaring” a log near Aylen Lake, Ottawa Valley, Ontario. In the mid 1800s, a distinct tradition of singing and playing dance tunes developed in the pine woods of New England and Atlantic Canada. Newly-arrived Irish immigrants supplemented summer work on farms and sailing ships with winters in logging camps where men sang and played fiddles to pass the evening hours in the bunkhouses. The rich repertoires of songs and tunes carried by these Irishmen had a defining influence on this new evolving musical style. 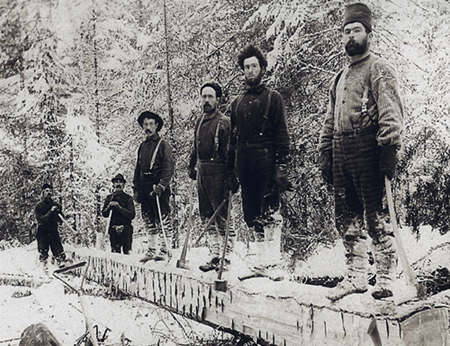 Later, musical lumberjacks born into tight-knit communities in New Brunswick, Maine, New York State, Quebec and Ontario followed their jobs to the rivers and snowy forests of Michigan, Wisconsin and Minnesota as the industry cut its way west. Some of their songs were direct imports from Ireland or Scotland while others used the old song forms to tell tales of the hard life working up north. These men were as likely to sing about the dangers of fighting Napoleon with the English army as they were to sing about the mosquitoes on the St. Croix River. They played French-Canadian fiddle tunes and Irish jigs while men step danced on the bunkhouse floor or, sometimes, on the dining hall table tops! Folklorists often use the terms “woods music” or “woods tradition” to describe these songs and dance tunes that were once characteristic of North America’s white pine belt. Inspired by a term I grew up with in Bemidji, Minnesota I chose “northwoods” when naming my blog. Another option could be “Great Lakes songs” since the same repertoire was largely shared and contributed to by Great Lakes sailors–many of whom also worked in the woods during the winter months. Whatever the name, there was certainly a common repertoire and, to some extent, singing style common throughout this broad region.